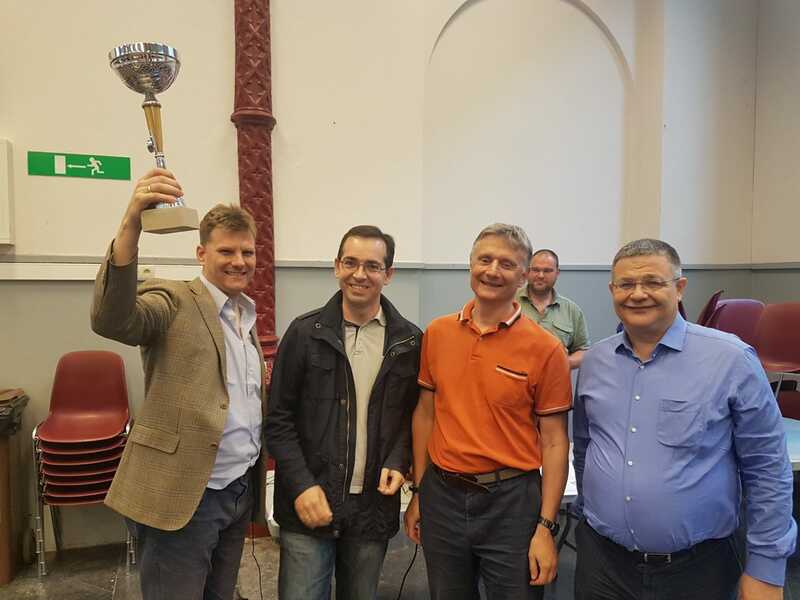 The 2018 FEFB Intercercles ended with a big success for Europchess! 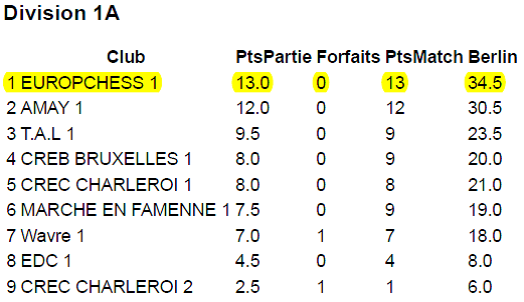 For the second time in its history Europchess won the Championship! The first team was slightly lagging behind Amay 1 and needed a clear win to maintain chances for the title. On board 3, Frank Hoffmeister played with Black against Tagumpay Gravidez (1793) from CREB 1. White played a symmetric opening line and got an equal middle game position. However, Frank could create some imbalance and once he took control over the e-file, he could push for an advantage. White first lost a pawn, and when his queen was trapped he resigned. Afterwards, Pere Moles Palleja (Black) won on board 4 against Benjamin Maltier (EDC) (1633). His opponent play very well the opening reaching a Benoni-like structure that looked very promising for White. However, with an interestingpositional pawn sacrifice, Pere got good compensation, getting control of the long dark diagonal and the a column. White blundered and a bishop got trapped. Shortly afterwards, white blundered again and lost an exchange, and the game. Georgi Tomov on board 2 won a pawn in the early middlegame against Yousif Eid (CREB). He entered an endgame and accepted opposite coloured bishops to cash in a second pawn. 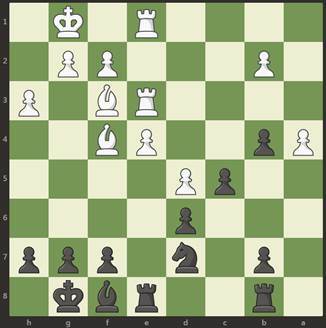 With impeccable technique he then converted his material plus as Black was unable to guard a passed f-pawn and a passed a-pawn at the same time. With this result, we just needed another draw, as Amay had finished with 2.5-1.5 only. However, Tim Binham could safely play for a win in a roughly equal rook ending. His more active king and rook allowed him to create a passed b-pawn which decided the day a couple of moves later. 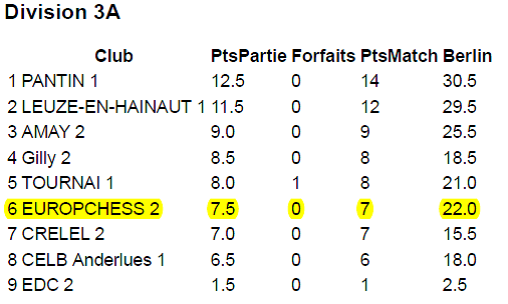 With this neat 4-0 Europchess became FEFB champion for a second time after 2016! The second team avoided relegation from Division 3 by pocketing 3.5 points against Gilly 2 and EDC 2, to finish in 6th place.